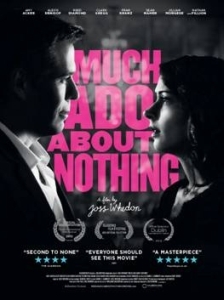 After delivering a barnstorming superhero flick with Avengers Assemble (2012), Joss Whedon took the curious decision to adapt William Shakespeare’s Much Ado About Nothing, filming in his own Los Angeles home under tight budgetary restrictions and time constraints. By supplanting his celebrated dialogue with that of the greatest wordsmith of them all, Whedon could have easily set himself up for a fall, but the director shows himself to be an arch and intuitive interpreter of the Bard, his film playing like a younger, scrappier descendant of Kenneth Branagh’s definitive 1993 version of the same play. One of the great Shakespeare comedies, Much Ado About Nothing opens with Don Pedro (Reed Diamond), the Prince of Aragon, with his followers Benedick (Alexis Denisof) and Claudio (Fran Kranz), visiting Leonato (Clark Gregg), the Duke of Messina, father of Hero (Jillian Morgese) and uncle to Beatrice (Amy Acker). While Claudio and Hero immediately fall in love and agree to marry, Beatrice and Benedick engage in a ‘merry war’ of comic bickering. As the others plot to make the latter pair fall in love with each other, Don John (Sean Maher), the prince’s misanthropic illegitimate brother, contrives a scheme to break up the former couple’s impending nuptials. Whedon’s Much Ado About Nothing is as indebted to cinematic history as it is to literary tradition. While the snappy dialogue is easily assimilated into a modern setting, the more elaborate theatricalities and rarefied silliness could have proved a touch unpalatable for modern filmgoers. The director’s stroke of genius is to aim for the tone of a 1930s screwball comedy, shooting in black and white and draping his cast in suits and dresses, allowing for the witty wordplay to blend seamlessly with the more anachronistic contrivances such as mistaken identities and dastardly plots. The cast, largely made up of Whedon alumni, could have easily turned the whole thing into a smug in-joke or a knowing lark, but they operate more like a repertory company; their familiarity with the director’s style allowing them deliver the lines with crisp focus and comic adroitness while retaining the brisk wit commonly associated with the filmmaker’s oeuvre. Much Ado About Nothing is a fun and welcome step forward for Whedon; both lively and mischievous, it’s a film brimming with youthful vitality. This review was originally published on 26 February, 2013, as part of our Glasgow Film Festival coverage.